This article is about the genus. For other uses, see Pig (disambiguation). With around 1 billion individuals alive at any time, the domestic pig is among the most populous large mammals in the world. Pigs are omnivores and can consume a wide range of food. Pigs are biologically similar to humans and are thus frequently used for human medical research. probably from Old English *picg, found in compounds, ultimate origin unknown. Originally "young pig" (the word for adults was swine). Apparently related to Low German bigge, Dutch big ("but the phonology is difficult" -- OED). ... Another Old English word for "pig" was fearh, related to furh "furrow," from PIE *perk- "dig, furrow" (source also of Latin porc-us "pig," see pork). "This reflects a widespread IE tendency to name animals from typical attributes or activities" [Roger Lass]. Synonyms grunter, oinker are from sailors' and fishermen's euphemistic avoidance of uttering the word pig at sea, a superstition perhaps based on the fate of the Gadarene swine, who drowned. Old English sugu, su "female of the swine," from Proto-Germanic *su- (cognates: Old Saxon, Old High German su, German Sau, Dutch zeug, Old Norse syr), from PIE root *su- (cognates: Sanskrit sukarah "wild boar, swine;" Avestan hu "wild boar;" Greek hys "swine;" Latin sus "swine", suinus "pertaining to swine"; Old Church Slavonic svinija "swine;" Lettish sivens "young pig;" Welsh hucc, Irish suig "swine; Old Irish socc "snout, plowshare"), possibly imitative of pig noise; note that Sanskrit sukharah means "maker of (the sound) su. It is entirely likely that the word to call pigs, "soo-ie," is similarly derived. An adjectival form is porcine. Another adjectival form (technically for the subfamily rather than genus name) is suine (comparable to bovine, canine, etc. ); for the family, it is suid (as with bovid, canid). A typical pig has a large head with a long snout that is strengthened by a special prenasal bone and by a disk of cartilage at the tip. The snout is used to dig into the soil to find food and is a very acute sense organ. There are four hoofed toes on each foot, with the two larger central toes bearing most of the weight, but the outer two also being used in soft ground. The dental formula of adult pigs is 3.1.4.33.1.4.3, giving a total of 44 teeth. The rear teeth are adapted for crushing. In the male, the canine teeth form tusks, which grow continuously and are sharpened by constantly being ground against each other. Occasionally, captive mother pigs may savage their own piglets, often if they become severely stressed. Some attacks on newborn piglets are non-fatal. Others may cause the death of the piglets and sometimes, the mother may eat the piglets. It is estimated that 50% of piglet fatalities are due to the mother attacking, or unintentionally crushing, the newborn pre-weaned animals. With around 1 billion individuals alive at any time, the domestic pig is one of the most numerous large mammals on the planet. 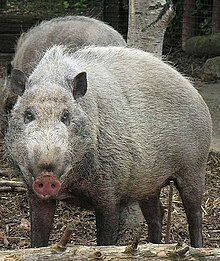 The ancestor of the domestic pig is the wild boar, which is one of the most numerous and widespread large mammals. Its many subspecies are native to all but the harshest climates of continental Eurasia and its islands and Africa as well, from Ireland and India to Japan and north to Siberia. Long isolated from other pigs on the many islands of Indonesia, Malaysia, and the Philippines, pigs have evolved into many different species, including wild boar, bearded pigs, and warty pigs. Humans have introduced pigs into Australia, North and South America, and numerous islands, either accidentally as escaped domestic pigs which have gone feral, or as wild boar. The wild pig (Sus scrofa) can take advantage of any forage resources. Therefore, it can live in virtually any productive habitat that can provide enough water to sustain large mammals such as pigs. If there is increased foraging of wild pigs in certain areas, it can cause a nutritional shortage which can cause the pig population to decrease. If the nutritional state returns to normal, the pig population will most likely rise due to the pigs' naturally increased reproduction rate. Pigs are omnivores, which means that they consume both plants and animals. In the wild, they are foraging animals, primarily eating leaves, roots, fruits, and flowers, in addition to some insects and fish. As livestock, pigs are fed mostly corn and soybean meal with a mixture of vitamins and minerals added to the diet. Traditionally, they were raised on dairy farms and called "mortgage lifters", due to their ability to use the excess milk as well as whey from cheese and butter making combined with pasture. Older pigs will consume three to five gallons of water per day. When kept as pets, the optimal healthy diet consists mainly of a balanced diet of raw vegetables, although some may give their pigs conventional mini pig pellet feed. Domesticated pigs, especially miniature breeds, are commonly kept as pets. Domestic pigs are raised commercially as livestock; materials that are garnered include their meat (known as pork), leather, and their bristly hairs which are used to make brushes. Because of their foraging abilities and excellent sense of smell, they are used to find truffles in many European countries. Both wild and feral pigs are commonly hunted. The relatively short, stiff, coarse hairs of the pig are called bristles, and were once so commonly used in paintbrushes that in 1946 the Australian Government launched Operation Pig Bristle. In May 1946, in response to a shortage of pig bristles for paintbrushes to paint houses in the post-World War II construction boom, the Royal Australian Air Force (RAAF) flew in 28 short tons of pig bristles from China, their only commercially available source at the time. Human skin is very similar to pig skin, therefore pig skin has been used in many preclinical studies. In addition to providing use in biomedical research and for drug testing, genetic advances in human healthcare have provided a pathway for domestic pigs to become xenotransplantation candidates for humans. The genus Sus is currently thought to contain eight living species. A number of extinct species (†) are known from fossils. The pygmy hog, formerly Sus salvanius is now placed in the monotypic genus Porcula. Pigs have been domesticated since ancient times in the Old World. Archaeological evidence suggests that pigs were being managed in the wild in a way similar to the way they are managed by some modern New Guineans from wild boar as early as 13,000–12,700 BP in the Near East in the Tigris Basin, Çayönü, Cafer Höyük, Nevalı Çori. Remains of pigs have been dated to earlier than 11,400 BP in Cyprus that must have been introduced from the mainland which suggests domestication in the adjacent mainland by then. A separate domestication also occurred in China. 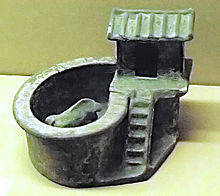 In India, pigs have been domesticated for a long time mostly in Goa and some rural areas for pig toilets. This was also done in China. Though ecologically logical as well as economical, pig toilets are waning in popularity as use of septic tanks and/or sewerage systems is increasing in rural areas. Pigs were brought to southeastern North America from Europe by Hernando de Soto and other early Spanish explorers. Pigs are particularly valued in China and on certain oceanic islands, where their self-sufficiency allows them to be turned loose, although the practice is not without its drawbacks (see environmental impact). The domestic pig (Sus scrofa domesticus) is usually given the scientific name Sus scrofa, although some taxonomists call it S. domesticus, reserving S. scrofa for the wild boar. It was domesticated approximately 5,000 to 7,000 years ago. The upper canines form sharp distinctive tusks that curve outward and upward. Compared to other artiodactyles, their head is relatively long, pointed, and free of warts. Their head and body length ranges from 0.9 to 1.8 m (35 to 71 in) and they can weigh between 50 and 350 kg (110 and 770 lb). In August 2015, a study looked at over 100 pig genome sequences to ascertain their process of domestication. The process of domestication was assumed to have been initiated by humans, involved few individuals and relied on reproductive isolation between wild and domestic forms. The study found that the assumption of reproductive isolation with population bottlenecks was not supported. The study indicated that pigs were domesticated separately in Western Asia and China, with Western Asian pigs introduced into Europe where they crossed with wild boar. A model that fitted the data included admixture with a now extinct ghost population of wild pigs during the Pleistocene. The study also found that despite back-crossing with wild pigs, the genomes of domestic pigs have strong signatures of selection at DNA loci that affect behavior and morphology. The study concluded that human selection for domestic traits likely counteracted the homogenizing effect of gene flow from wild boars and created domestication islands in the genome. The same process may also apply to other domesticated animals. Pigs appear in the traditional and popular arts, media, and cultures of many societies, where they sometimes carry religious symbolism. In Asia the wild boar is one of 12 animal images comprising the Chinese zodiac, while in Europe the boar represents a standard charge in heraldry. In Islam and Judaism pigs and those who handle them are viewed negatively, and the consumption of pork is forbidden. Epicureans consider the pig as an official mascot or totem, and bronze sculptures of pigs have been found in the Epicurean library at Herculaneum. Pigs are frequently alluded to in folk art, idioms, metaphors, and proverbs, and also occasionally in parables (e.g. Parable of the Prodigal Son). Pig at a German new year event, 1965. In European folklore, there is a widespread belief that pigs are intensely frightened by mirrors. In many European countries, a feast has formed around slaughtering a pig. In Germany, pigs are known as a symbol for good luck. Marzipan pigs are a popular confectionery, especially as a gift on New Year's Eve. Superstitious sailors consider pigs to be unlucky because they have cloven hooves like the Devil and are terrified of water. Pigs would not be carried on boats. Fishermen once regarded pigs as harbingers of bad luck: a fisherman seeing a pig on his way to work would rather turn round and go home. This even extended to a prohibition of the word "pig" on board a vessel. This is why the animals were referred to, across North East England, as "gissies". In ancient Egypt, pigs were associated with Set, the rival to the sun god Horus. When Set fell into disfavor with the Egyptians, swineherds were forbidden to enter temples. According to Herodotus, swineherds were a kind of separate sect or caste, which only married among themselves. Egyptians regarded pigs as unworthy sacrifices to their gods other than the Moon and Dionysus, to whom pigs were offered on the day of the full Moon. Herodotus states that, though he knew the reason why Egyptians abominated swine at their other feasts but they sacrificed them at this one; however, it was to him "not a seemly one for me to tell". In ancient Greece, a sow was an appropriate sacrifice to Demeter and had been her favorite animal since archaic times. Initiates at the Eleusinian Mysteries began by sacrificing a pig. Pig were also sacrificed to Aphrodite. The ancient Romans practiced a sacrifice called the suovetaurilia, in which a pig, a ram, and a bull were sacrificed, as one of the most solemn acts of the Roman religion. In Buddhism the deity Marici is often depicted riding in a carriage hauled by several pigs. The Celts had a god of swine called Moccus, who under Roman occupation was identified with Mercury. In Celtic mythology, a cauldron overflowing with cooked pork was one of the attributes of The Dagda. In the Chinese zodiac, the Pig is one of the 12-year cycle of animals. Believers in Chinese astrology associate each animal with certain personality traits (see: Pig (zodiac)). In Christianity the book of Mark, in an event referred to as the exorcism of the Gerasene demoniac Jesus casts the demons Legion (demon) possessing a swine herder from Gerasene; into 2000 of the swine herders pigs. In Haitian Vodou, Ezili Dantor, the lwa of motherhood, is associated with the black Creole Pig of Haiti, her favorite animal sacrifice. In Hinduism the god Vishnu took the form of a four-armed humanoid with the head of a boar named Varaha in order to save the Earth from a demon who had dragged it to the bottom of the sea. In Islam the eating of pork is also sinful (see Haraam). The Qur'an prohibits the consumption of pork in no less than 4 different places. It is prohibited in 2:173, 5:3, 6:145 and 16:115. "Forbidden to you (for food) are: dead meat, blood, the flesh of swine, and that on which hath been invoked the name of other than Allah." [Al-Qur'an 5:3] Islam treats pigs as inedible animals par excellence, the animal that is central to the concepts of haram. The dietary laws of Judaism (Kashrut) forbid, among other kinds of meat, the eating of pork in any form, considering the pig to be an unclean animal as food (see taboo food and drink). Pork is as forbidden as the meat of any other unclean animal, but probably due to extensive use of pork in modern days, abhorrence of pork is far stronger and emotional in traditional Jewish culture than that of other forbidden foods. Many Ancient Jews also held the prohibition on pigs above other taboos. In De Specialibus Legibus, Philo of Alexandria, a first-century Jewish writer, relates that pigs were lazy scavengers, the embodiment of vice. Philo also argued that since pigs will eat the flesh of human corpses, that men should abstain from eating them so as not to be contaminated. In Nordic Mythology, "Gold-Bristle" or "Gold-Mane" was Freyr's golden boar, created by the dwarves Brokk and Sindri as part of a challenge. His shining fur is said to fill the sky, trees, and sea with light. Among Seventh-day Adventists and some other denominations[who? ], the eating of pork is prohibited. Most Christians believe that the eating of pork is not prohibited, according to the teachings of the New Testament. In Catholicism, Eastern Orthodoxy, and other, older Christian groups, pigs are associated with Saint Anthony the Great, who is known as the patron saint of swineherds. Because of the biological similarities between each other, pigs can harbour a range of parasites and diseases that can be transmitted to humans. These include trichinosis, Taenia solium, cysticercosis, and brucellosis. Pigs are also known to host large concentrations of parasitic ascarid worms in their digestive tract. ^ "Piglet - Definition and More from the Free Merriam-Webster Dictionary". Merriam-webster.com. 31 August 2012. Retrieved 15 September 2013. ^ Angier, Natalie (10 November 2009). "Pigs Prove to Be Smart, if Not Vain". The New York Times. ^ a b "PSD Online - Custom Query". usda.gov. ^ "Pig And Human Digestive System". prezi.com. Retrieved 15 April 2016. ^ Loren Grush (2015-03-24). "Why pigs are so valuable for medical research". Fox News. Retrieved 15 April 2016. ^ a b Harper, Daniel (n.d.). "Sow". Online Etymology Dictionary. Retrieved December 4, 2015. ^ a b c "ADW: Sus scrofa: INFORMATION". Animal Diversity Web. ^ Kim Lockhart. "American Wild Game / Feral Pigs / Hogs / Pigs / Wild Boar". gunnersden.com. Archived from the original on 2018-08-23. Retrieved 2018-12-03. ^ North Carolina Pork Conference Archived 2007-08-20 at the Wayback Machine – Management Tips to Reduce Pre-Weaning Mortality. 2002. North Carolina State University. ^ "Diet and Nutrition on Modern Pig Farms - Pork Cares". Pork Cares. Retrieved 2017-10-17. ^ "farmdoc - Marketing&Outlook: WILL HOGS RECLAIM "MORTGAGE LIFTER" STATUS?". illinois.edu. ^ "How Much Water Do Pigs Need?". ncsu.edu. ^ "29 May 1946 - PIG BRISTLES FOR PAINT BRUSHES - Trove". Trove. Retrieved 15 April 2016. ^ a b Herron, Alan J. (5 December 2009). "Pigs as Dermatologic Models of Human Skin Disease" (PDF). ivis.org. DVM Center for Comparative Medicine and Department of Pathology Baylor College of Medicine Houston, Texas. Retrieved 27 January 2018. pig skin has been shown to be the most similar to human skin. Pig skin is structurally similar to human epidermal thickness and dermal-epidermal thickness ratios. Pigs and humans have similar hair follicle and blood vessel patterns in the skin. Biochemically pigs contain dermal collagen and elastic content that is more similar to humans than other laboratory animals. Finally pigs have similar physical and molecular responses to various growth factors. ^ "British MoD surgeons practise operations on drugged pigs which are strung-up and shot by marksmen to simulate warzone first aid". Daily Mail. 2014-02-18. ^ Swindle, M. M.; Makin, A.; Herron, A. J.; Clubb, F. J.; Frazier, K. S. (2012). "Swine as Models in Biomedical Research and Toxicology Testing". Veterinary Pathology. 49 (2): 344–356. doi:10.1177/0300985811402846. PMID 21441112. ^ Jeffery, Simon (2002-01-03). "Pig to Human transplants". The Guardian. ^ Funk, Stephan M.; Kumar Verma, Sunil; Larson, Greger; Prasad, Kasturi; Singh, Lalji; Narayan, Goutam; Fa, John E. (2007). "The pygmy hog is a unique genus: 19th century taxonomists got it right first time round". Molecular Phylogenetics and Evolution. 45 (2): 427–436. doi:10.1016/j.ympev.2007.08.007. PMID 17905601. ^ Rosenberg, M; Nesbitt, R; Redding, RW; Peasnall, BL (1998). "Hallan Cemi, pig husbandry, and post-Pleistocene adaptations along the Taurus-Zagros Arc (Turkey)"". Paleorient. 24 (1): 25–41. doi:10.3406/paleo.1998.4667. ^ Ottoni, C.; Girdland Flink, L.; Evin, A.; Geörg, C.; De Cupere, B.; Van Neer, W.; Bartosiewicz, L.; Linderholm, A.; Barnett, R.; Peters, J.; Decorte, R.; Waelkens, M.; Vanderheyden, N.; Ricaut, F. X.; Çakırlar, C.; Cevik, O.; Hoelzel, A. R.; Mashkour, M.; Mohaseb Karimlu, A. F.; SheikhiSeno, S.; Daujat, J.; Brock, F.; Pinhasi, R.; Hongo, H.; Perez-Enciso, M.; Rasmussen, M.; Frantz, L.; Megens, H. J.; Crooijmans, R.; et al. (2012). "Pig domestication and human-mediated dispersal in western Eurasia revealed through ancient DNA and geometric morphometrics". Molecular Biology and Evolution. 30 (4): 824–832. doi:10.1093/molbev/mss261. PMC 3603306. PMID 23180578. ^ Vigne, JD; Zazzo, A; Saliège, JF; Poplin, F; Guilaine, J; Simmons, A (2009). "Pre-Neolithic wild boar management and introduction to Cyprus more than 11,400 years ago". Proc Natl Acad Sci U S A. 106 (38): 16135–16138. Bibcode:2009PNAS..10616135V. doi:10.1073/pnas.0905015106. PMC 2752532. PMID 19706455. ^ Giuffra, E; Kijas, J. M.; Amarger, V; Carlborg, O; Jeon, J. T.; Andersson, L (April 2000). "The origin of the domestic pig: independent domestication and subsequent introgression". Genetics. 154 (4): 1785–91. PMC 1461048. PMID 10747069. ^ "Scientists Sequence Entire Pig Genome in Breakthrough That Could Combat Human Disease". 2012-11-14. ^ "Scientists decode the pig genome". Business Standard India. 2012-11-15. ^ Groenen, Martien A. M.; Archibald, Alan L.; Uenishi, Hirohide; Tuggle, Christopher K.; Takeuchi, Yasuhiro; Rothschild, Max F.; Rogel-Gaillard, Claire; Park, Chankyu; Milan, Denis; Megens, Hendrik-Jan; Li, Shengting; Larkin, Denis M.; Kim, Heebal; Frantz, Laurent A. F.; Caccamo, Mario; Ahn, Hyeonju; Aken, Bronwen L.; Anselmo, Anna; Anthon, Christian; Auvil, Loretta; Badaoui, Bouabid; Beattie, Craig W.; Bendixen, Christian; Berman, Daniel; Blecha, Frank; Blomberg, Jonas; Bolund, Lars; Bosse, Mirte; Botti, Sara; et al. (2012). "Analyses of pig genomes provide insight into porcine demography and evolution". Nature. 491 (7424): 393–8. Bibcode:2012Natur.491..393G. doi:10.1038/nature11622. PMC 3566564. PMID 23151582. ^ Eyers, Jonathan (2011). Don't Shoot the Albatross! : Nautical Myths and Superstitions. London, UK: A&C Black. ISBN 978-1-4081-3131-2. ^ Sacrifice Goats, female or male Archived 2008-12-07 at the Wayback Machine. ^ "issg Database: Ecology of Sus scrofa". issg.org. ^ "Pig Health". The Pig Site.